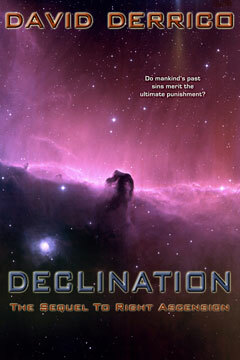 Do mankind’s past sins merit the ultimate punishment? "A morality play transformed into high adventure and that’s a working definition of science fiction at its best." Top 1,000 (overall Kindle) Amazon Bestseller! A continuation of the saga begun in Right Ascension, Declination finds us in the year 3050, ten years after the dreadful Lucani Ibron have been driven from Earth. Now, the Confederation’s crises are spawned from within, and one brave woman struggles against all odds to keep mankind united amidst a hailstorm of rebellion, war, and moral declination. The Lucani Ibron have yet to return, but all is not well within the Alpha Sector. Internal strife, terrorism, and ever-escalating conflicts with several neighboring species have spread the Confederation’s resources dangerously thin. Captain Anastasia Mason, together with an eclectic group of humanity’s most decorated heroes, struggles to hold the Confederation together against powerful forces that threaten to rip it apart at its very core. Then, at what appears to be mankind’s most desperate hour, an old enemy returns from a ten-year hiatus, casting humanity to the brink of civil war … and outright annihilation.